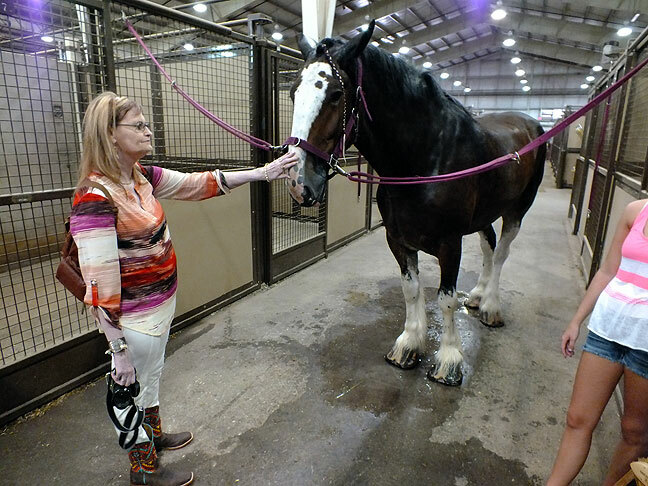 Abby pets a Percheron draft horse on the nose prior to its appearance in today’s Oklahoma State Fair events. Abby turns to tell me something as we watch the Draft Horse Show today. 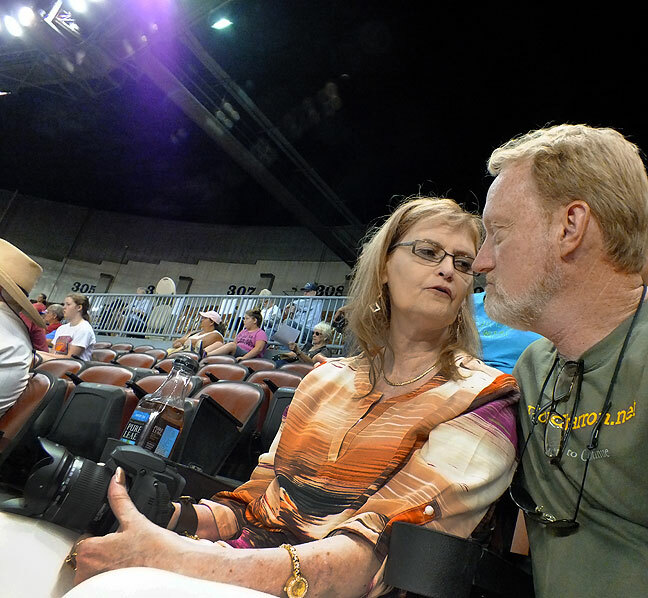 My wife Abby has wanted to see some of the Oklahoma State Fair, particularly the very large livestock, for years now, and we finally remembered to add it to our calendar. 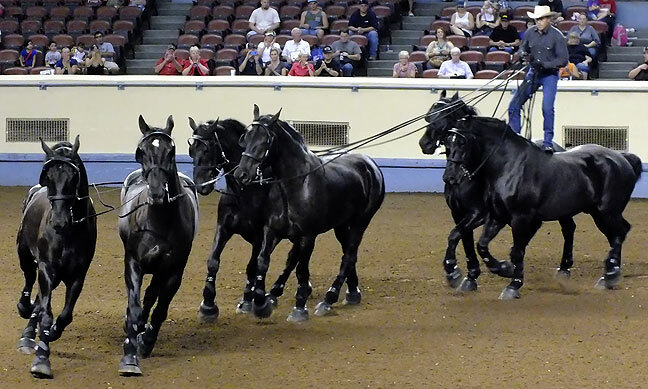 Today was the last day of the fair, but featured two events Abby was eager to see: the Draft Horse Show, and the North American Six Horse Hitch Classic Series Championship Round. Abby was particularly impressed with this act, which featured a single rider on a team of six unhitched horses. 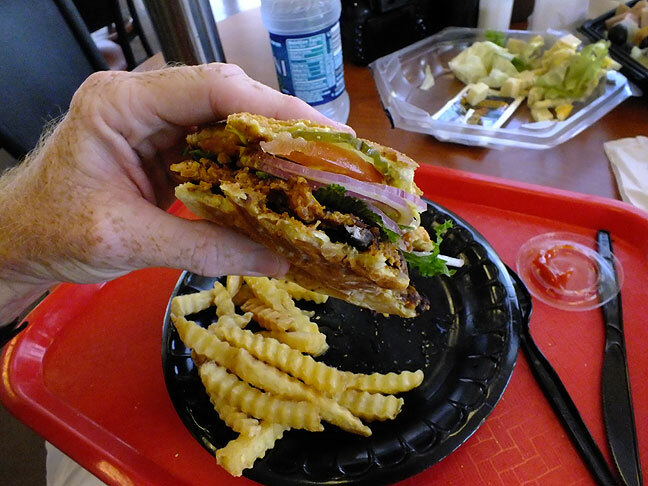 Normally one thinks of state fairs as homes of funnel cakes an scorpion pizza (true story), but Abby had a salad, and I found this veggie burger. We got up extra early and made the 90-minute drive in time to see our events, visiting some of the animals in the barns, and a bit of the car show, plus a lunch break in the middle. Abby found the draft horses absolutely fascinating. I had no idea what to expect, but I found it quite interesting. We both had an amazing time. I’m as impressed with Abby’s boots as I am with the horses. Also? Those fries look so good. I didn’t get lunch today. Only time I’ve ever been was in September 2001, with my Dad and brother… We had a very enjoyable time. That’s when I found out my brother didn’t like crazy rides, so I ended up riding several by myself while they watched and tried not to get nauseous. I’m glad you all had a good time. I wish state fairs in Texas would be a little later in the year. It’s usually too hot in September for me.